Much focus has been placed on green living in the last few years. People are encouraged to recycle materials, purchase only what is needed, and avoid waste because it is easy to see what the wasteful and polluting nature of the past has done to our world. Many companies have decided to focus on the creation of green products in the last few years and the demand for these products are skyrocketing as more people become aware of the attractive appearance of many green products. One green product that is creating a storm of discussion is the Alkemi kitchen countertop, created by Renewed Materials, LLC. 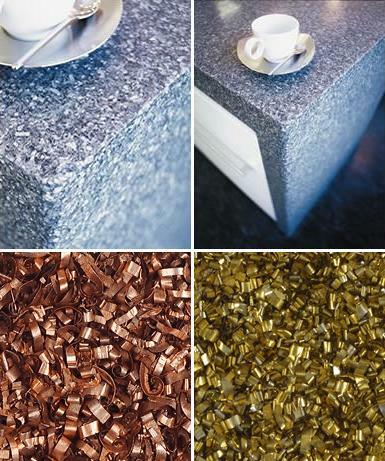 These countertops are created from recycled metal shavings which are then embedded into a base of specially formulated resin. The resin seals the metal shavings beneath a thick see through layer so that the beauty of the metal shavings is the focal point of the countertop. The resin that creates the base for the Alkemi kitchen countertop can be produced in a variety of different colors to appeal to a wider range of homeowners, including those who are trying to match the existing décor of their home. The colors available for the resin of the countertop include blue, green, brown, and clear and each of the colors are subtle enough to allow the gleam of the metal shavings embedded inside to shine through. The brown colored resin makes the metal shavings locked inside look like copper coils, which is a really cool effect. Alkemi kitchen countertops are durable, but some care will need to be taken to ensure that the countertop remains looking new for a long period of time. Hot items should never be placed directly on the surface of the countertop because it can damage the countertop surface and mar the beauty of the countertop beyond repair. An item should always be placed between the countertop surface, such as a pot holder or trivet, so that the heat of the item does not come into direct contact with the countertop surface. Alkemi kitchen countertops are also stain resistant and able repel water, oils, and other liquids from the surface of the countertop. Any items that are spilled on the countertop should be removed quickly using a simple solution of soap and water applied with a non-abrasive sponge or dish cloth. This removes the item before it is allowed to dry to the surface of the countertop and provide a home for bacteria and fungi that could harm the health of you and your family. Alkemi kitchen countertops can be ordered direct from the manufacturer or from solid surface countertop retailers that receive shipments of the material from the manufacturer. Trained professionals will install the materials on site and provide you will all of the information needed about the care and the maintenance of the countertop. As a green countertop, the Alkemi kitchen countertop is a very stylish and attractive option.